Mahindra offers Rexton as a powerful SUV that comes packed with advanced features like 8-way electrically adjustable driver seat with memory settings, touch-screen infotainment system with maps, sunroof, automatic climate control, rain sensors and auto headlamps. Fuel-efficiency and high performance is achieved with the provision of a 2.7-litre RX270 XDi turbocharged diesel engine that gets mated to the 5-speed E-tronic automatic transmission.This helps in giving smooth and quite operation. Moreover,introducing torque-on-demand system greatly helps the commuters to ride better even in unfavorable conditions.This system allocates most of the power to the rear wheels under normal driving conditions, and automatically shifts more torque to the front wheels when road conditions decline.thus enable the drivers to drive safely.Considering the safety aspects, features like a rear obstacle warning system, panic alarm, and an immobilizer have been provided. Especially immobilizer show its interest in preventing the illegal reproduction of the key.Thus performance, fuel economy, comfort, versatility, and safety all get contained within this Rexton. It falls under the price bracket of Rs.19.75 lakhs. Mahindra Rexton SUV is available in 3 variants. View below listing of variants based on their fuel type. Upcoming variants of Rexton SUV are also listed here. * Prices of Mahindra Rexton SUV car indicated here are ex-showroom price not the on road price of Rexton SUV. Price list is subject to change and for the latest Mahindra Rexton SUV India prices, submit your details at the booking form available at the top, so that our sales team will get back to you. Mahindra Rexton SUV mileage mentioned here is based on ARAI test drive and not from Rexton SUV review by vicky team. "The prime specs of Mahindra Rexton SUV are listed here. The overall length, width of the car should give you an idea about parking space it require. The ground clearance (lowest part of the car to the ground) will give you the measure of water wading capability and confidence of Rexton SUV's capability to run over potholes and speed breakers. However GC (ground clearance) won't tell everything. 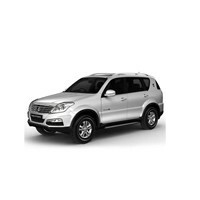 Other important factors like approach angle, breakover angle and departure angle is required to assess the cars' ability to run in rained indian roads and light off road tracks.Engine specs of Rexton SUV are also listed here. With the power (in bhp) and torque (Nm) figures the most important ratios - power to weight ratio of Rexton SUV and torque to weight ratio. The displacement (in cc) is the measure of cubic capacity of the engine. Earlier there was a notion, larger engines produce more power and torque however with the invention of advanced technologies this is no longer true." I am waiting to drive the car and to know about safety features.